STANSFIELD, a township, of three divisions, in Halifax parish, W. R. Yorkshire; on the river Calder, the Rochdale canal, and the Lancashire and Yorkshire railway, 4½ miles W of Halifax. It has post-offices under Todmorden; and it contains Crosstone church, three dissenting chapels, and a national school. There is a baptism in the parish church of Heptonstall on 9 February 1796. The father was John Speak and the mother was Mary Townend. For the first years of his marriage Abraham appears to have been attending a Baptist church. His eldest child was later baptised in another Independent church at the age of 9. Something similar may have happened to Abraham. John Speak and Mary Townend married in Heptonstall in 1785, so this scenario is possible, but the evidence is not conclusive. Heptonstall lies just above Hebden Bridge in the Calder Valley that links Halifax to Burnley. Halifax was the biggest parish in England and was sub-divided into townships and chapelries, of which Heptonstall was the most important. This had no major towns, such as Hebden Bridge in Wadsworth, or Todmorden, which straddles Stansfield and Langfield, but largely held farms and hamlets in bleak moorland landscapes. It was the sheep from those hills which would have provided Abraham with his living as a weaver. Historically a centre for hand-loom weaving, Heptonstall’s cottages and terraced houses are characterised by large first-floor windows to maximise the light for weaving. MARY PICKLES gave her birthplace as Stansfield and her age as 52 in the 1851 census. This would make her born in 1798-9. We have found no baptism for her around that time, but this might be explained by her parents attending a Baptist church. The nearest matching record is in 1837, when Mary, daughter of William and Sally Pickles is recorded as being born on May 15 1797 and baptised at the Wesleyan Methodist church in Todmorden on June 6 1837. The abode is Stansfield and the occupation, presumably of the father, is weaver. This Mary would have been 40 years old. There is no mention of her being a married woman with the surname Speak, but the baptismal register does not have a column to accommodate this. We know from the birth certificates of her children that Mary’s father was William Pickles. The Speaks named their second daughter Sally. If this is Abraham’s wife, then we can only speculate why she sought a Methodist baptism at this late stage. The family seem to have moved around non-conformist churches. Perhaps Mary was born into a Baptist family and received infant dedication, but then moved to a different Independent church which assumed she had been baptised as an infant. It may not have been until her later years that she realised this omission. 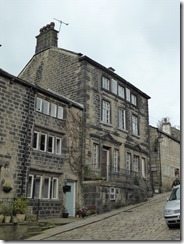 Abraham Speak married Mary Pickles in Heptonstall on 18 January 1818. He was then described as ‘a weaver of Stansfield’, nearer Todmorden. They would have married at the Anglican church because it protected them for future need of poor law relief. Abraham and Mary were, however, non-conformists. They had two daughters baptised at Myrtle Grove Independent, Eastwood by Todmorden, in 1828. The chapel was demolished but the old graveyard is on the left halfway along the road from Hebden Bridge towards Todmorden. Grace was born 17 June 1819. Sally was born on 25 Sept 1827. Both girls were baptised at Myrtle Grove (or Eastwood) Chapel in Stansfield on 14 July 1828. Grace was aged 9 years and Sally 10 months. Nine is rather young for believer’s baptism, and 10 months is later than normal for infant baptism. The family had probably previously been attending a Baptist chapel, which did not practise infant baptism, and then moved to this Independent church, which did. The entries in the baptismal record are interesting. There may have been other children born in the 8-year gap between these two. Perhaps they died in infancy, without being baptised. These unbaptised babies probably underwent a service of infant dedication. The Speaks transferred their attendance back to the Baptists. The births of two more daughters were registered at the General Baptist Chapel, Heptonstall Slack in the early thirties. Slack stands high on the northern side of the Calder Valley. And of Mary Speak his Wife, who was the Daughter of William Pickles, was born in Daisy Bank, Stansfield in the Parish of Halifax in the County of York the second Day of October in the Year One Thousand and eight hundred and thirty one at whose Birth we were present. And of Mary Speak his Wife, who was the Daughter of William Pickles, was born in Daisy Bank, Stansfield in the Parish of Halifax in the County of York the ninth Day of May in the Year One Thousand and eight hundred and thirty three at whose Birth we were present. These are consecutive entries in the register, even though some succeeding ones are for earlier births. They seem to be arranged in alphabetical order of surnames for a given period. It is not unusual for non-conformist birth and baptism records to give information not found in parish registers, such as the mother’s parents. If the baptism at Todmorden Methodist Church in 1837 of 40-year-old Mary, daughter of William and Sally Pickles, is Abraham’s wife, then the Speaks were still in Stansfield. The family have not been found in the 1841 census. By 1851 they have moved into Lancashire. Only the youngest daughter, Betty, is still at home. They are living at Height Side, Bacup, in the township of Newchurch. Neither of the parents is in work. Before the time of state pensions it was unusual for a man not to be working at 63. Abraham may have been incapacitated in some way or had been forced out of work as a handloom weaver by cheaper factory goods and had not found alternative employment. Given the demand for labour at that time, the former seems more likely. Between 1824 and 1865 35 cotton mills were erected in Bacup. Posters were put up as far away as Norwich, inviting workers to move to Bacup. Some came from even further afield. They arrived to find the promises of free travel, good wages and a furnished house were untrue. They had to refund their fares and buy furniture from the meagre pay they gained for working long hours. But there was certainly work available. 18-year-old Betty is almost certainly tending looms in a cotton mill, rather than weaving by hand as her father did. Neither Abraham nor Mary has been found in the 1861 census. There is a death record for Abraham Speak in Haslingden District in the second quarter of 1856. This district included Bacup. Mary’s death is more doubtful. There is death in the first quarter of 1859 in the Bradford District. In 1861 Bacup’s prosperity came to an abrupt halt. The American War of Independence cut off the supply of cotton. 3000 of its 6000 operatives were out of work. The other 3000 were working 2-3 days a week. It was doubtful whether the Speaks had ever shared that prosperity. Censuses and Yorkshire BMDs from Findmypast.